Never mind “Spreadsheet” Phil, he’s Phantastic Phil in our books now he’s scrapped Stamp Duty for first time buyers on all properties valued at up to £300,000. That equates at up to £5,000 additional cash to put towards your deposit so if you’ve been saving to get your funds together you might find you are in a position to make a purchase a lot sooner that you previously thought.. This isn’t going to make the market any less competitive, however, so don’t delay in getting the advice to need to put yourself in the ideal position to make a successful offer. Crosby Mortgage Solutions are not a national, high tech, web driven, internet based virtual company. No, we are a family run, people based firm who believe that no amount of typing or clicking can beat a proper conversation over a cup of tea - drop of milk, no sugar thanks! Sure, we use plenty of market leading technology in the back office, but we don’t let it get in the way of talking to our clients and finding out exactly what your needs are. So don’t expect any bells and whistles on this site - just some background information on the services that we offer. If you think we sound like the sort of people you would like to arrange your mortgage, protection or insurance then drop us a line and we’ll be delighted to arrange an appointment to meet with you. At the appointment we will find out all about your specific circumstances and requirements and then source a mortgage and supporting policies to meet your individual needs. We have access to a range of mortgage products from across the market so can access a wide range of deals not only from the high street and also deals from less well known and regional lenders, but also specialist deals that are not available directly to the public. In terms of appointments we can meet you at our office on Brompton Avenue or if you’d prefer your home or place of work. Whilst we love a daytime meeting, we appreciate that that might not always be convenient so are more than happy to meet with clients in the evening or even at weekends. We hope you find the site of use and look forward to hearing from you soon. Crosby Mortgage Solutions does not charge for an initial consultation meeting. A broker fee of £395 will be charged on application. 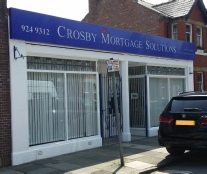 Crosby Mortgage Solutions Ltd registered in England at Legacy House, 11 Eshe Road Liverpool, Merseyside L23 3AR (number 6457579). Crosby Mortgage Solutions Ltd is an appointed representative of PRIMIS Mortgage Network (PRIMIS) - a trading name of First Complete Limited which is authorised and regulated by the Financial Conduct Authority. PRIMIS is only responsible for the service and quality of advice provided to you in relation to mortgages, protection insurance and general insurance products. Any other service offered by Crosby Mortgage Solutions Ltd may not be the responsibility of PRIMIS and may also not be subject to regulation by the Financial Conduct Authority. This website does not collate Cookie data.